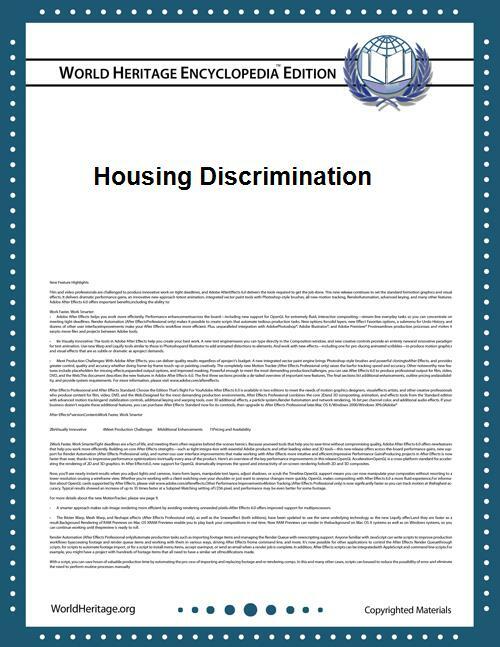 Housing discrimination is discrimination based on protected class status, variously including race, gender, religion, ethnicity, age, national origin, sexual orientation and gender identity, marital status, or veteran status, in the realm of housing and real estate. Four types of housing discrimination are rental discrimination, sales discrimination, lending and mortgage discrimination and homeowners insurance. In the United States, the Office of Fair Housing and Equal Opportunity is charged with enforcing fair housing laws, based on the Fair Housing Act of 1968. Richard R.W. Brooks and Carol M. Rose, Saving the Neighborhood: Racially Restrictive Covenants, Law, and Social Norms. Cambridge, MA: Harvard University Press, 2013.